The Rocky Mountain Tribal Leaders Council (RMTLC) is dedicated to improving health, economic development and education for Tribes and their members through a variety of programs, policy recommendations, and Tribal Leader meetings. RMTLC also endeavors to coordinate advocacy and promote the similar interests of member Tribes through various collaborative initiatives and projects. Join the MPCA for Patient Centered Communities – Medication Assisted Treatment (MAT) and MH/SUD Agencies. A training designed specifically for agencies provided in partnership with the American Society of Addiction Medicine (ASAM) and PCSS-NOW on Tuesday, March 12 from 2:45 PM to 5:15 PM at The Billings Hotel & Convention Center in Billings, MT. 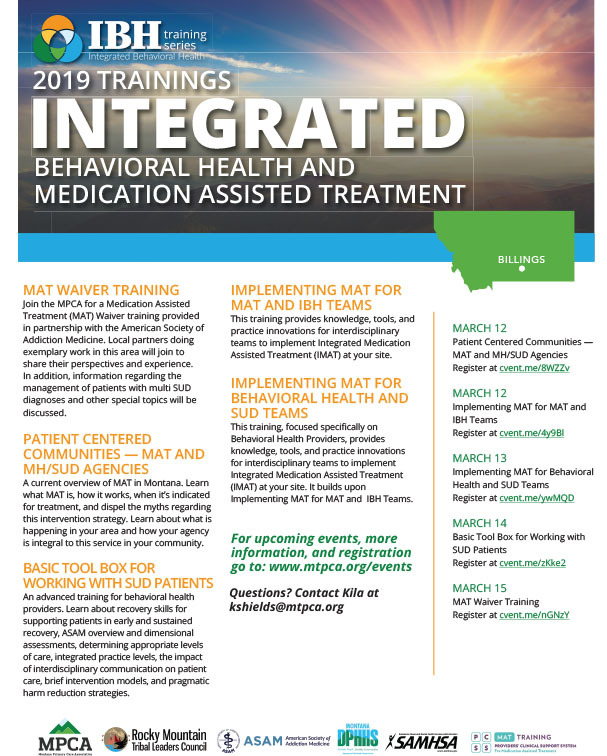 This training provides a current overview of MAT in Montana. Learn what MAT is, how it works, when it’s indicated for treatment, and dispel the myths regarding this intervention strategy. Learn about what is happening in your area and how your agency is integral to this service in your community. My name is James Holt, Buffalo Field Campaign board member, and Nez Perce tribal member. I send this letter as a request for your support. The plight of our relative Qolqaalx (Buffalo) in Yellowstone is known to us all. At this time, we have an opportunity to influence the disposition of critical bison habitat on National Forests in the region. We know the sacred relationship with the land and bison is paramount to Indian peoples. Buffalo Field Campaign also believes in the spirit of the buffalo. We strive to build unity in actions that secure the long-term viability of Yellowstone bison herds. Your support helps make this possible.